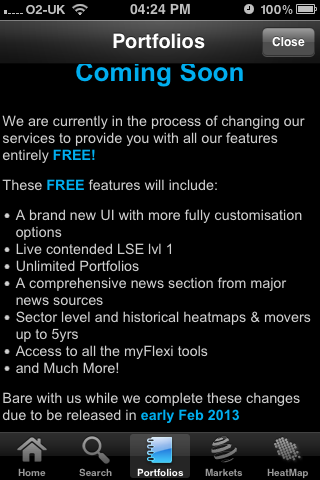 I have been using this FlexiTrade app for a few day now, it's definately the best app since Shareprice. It works well, still lacks a lot of the things you have come to expect on Shareprice, but should get better! Just realised that Tej provides a link in his message below also. Hi harumpf - can you post a link please - my feeble attempts at locating the site through google have produced nothing at all! 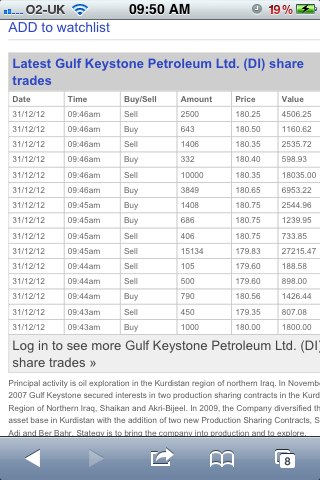 After loosing Shareprice I have just downloaded FlexiTrade recently onto my Iphone as an App. It provides Level 1 realtime prices that are streamed (Free). The layout is generally similar to Shareprice although they are working on updating other features that will also be available free early Feb 13. The chart per share is not good (assuming I have learnt how to use it properly). Maybe these will be improved as part of the new features that are not accessible yet. 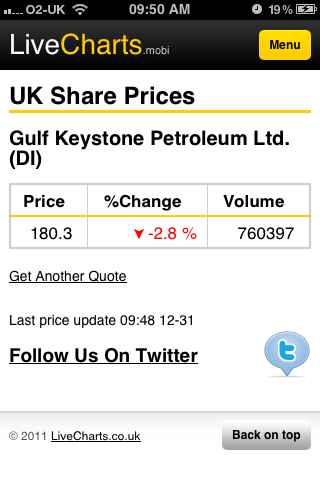 The problem with LiveCharts is that the prices do not stream, and unless I am doing something wrong, the charts are only for a limited range of shares, excluding, for example, GKP, as shown in your screenshot. MoneyAM provide a free streaming service but it has to be refreshed every so often as it times out, but for £5 a month, you can upgrade to continuous streaming and watchlists etc. Very handy when on the move, on an iPad, etc. No, but you do get a Watchlist, which is live and you can view via mobile live although you have to refresh! I have added to my home screen on my mobile. If I need to know live prices, this works for me. Does it let you set up a free watch list like on shareprice, if you register?